What is Irenthoth’s Dream album about, what is its meaning, how and why it came to existence, and who is Irenthoth? I (Michael) will try to discuss these questions while avoiding spoilers regarding the book as best as I can. Book? 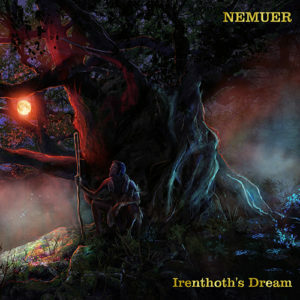 Yes, Nemuer’s music is the official soundtrack for my upcoming fantasy book. Each album corresponds to one chapter of the book. Although we think music do not necessarily have to have a given definite meaning, we know you would like to know more about our debut album. I think it could lose some of its magic if explained to much in detail and it is best for everybody to find its meaning by themselves. Last but not the least, there are certain hidden small things in the book and in the music as well that I simply cannot reveal and deprive you of finding out yourself. What I can do, though, is to give you a decent background that can help you understand or arise your own ideas. Although many of our listeners connect this album to nordic or pagan music, it is essentially set in ancient Maya empire. One of the important things for this civilization is their perception of time that is similar to most of the ancient people and very different to ours. It is known that it was common to perceive time in repeating circles not as a line. Every single track corresponds to a scene, object, or thought in the book. The album does not cover the entire story but only a selected part of it. Without saying too much I can only reveal it is set in the very “Forgotten Mountain”. The album features several ethnic instruments: jaw harp, didgeridoo, djembe, and udu. Deliberately there are no recognizable words, and I produce sounds we call “primordial chanting”. This vocal style enhances the tribal feeling of it, since we perceive it as a link to a distant past; it also gives us space to express the unutterable–the ancient gods’ will and presence. Acoustic guitar, the core of the entire album, represents here a certain out-of-place artifact (instrument from a different time period). It is the storyteller’s main instrument. 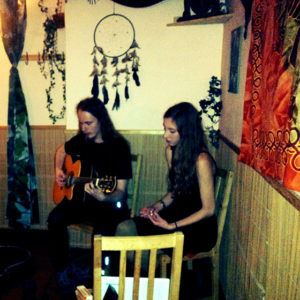 The whole album is a journey constantly jumping between shamanic and dreamy experience. While some tracks had their basis a long time ago, even before I started thinking about the book (Forgotten Mountain, On The Run), others were created within a very short time in a spontaneous outburst of my creative energy and unexpressed feelings (Red Moon, Under The Tree of Memories). But they all evolved and formed to fit perfectly to the theme eventually. There was no struggle in that, it was a natural process. 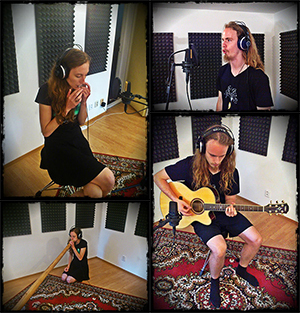 Some parts (mostly vocals) were created during the recording session with Jan Petrik. 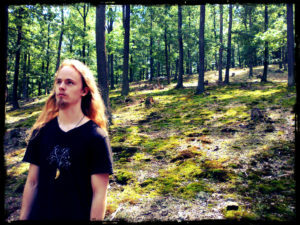 “End of the World” track played a very special role in the album making and Nemuer’s direction in general. It was the newest and the most surprising track that gave the whole album and Nemuer its identity. I composed it shortly after I returned from my stay in the Northern Finland. In fact, back there I started spontaneously composing a new track that did not fit 1st nor 2nd album, but helped me to develop our style and vocal techniques. And that very technique was used in the “End of the World” track. It struck me as a great idea to use the same chords as in the opening track “Forgotten Mountain” to close the circle but close it with vigour and certain divine ferocity. Why did we make the album? I never really felt like I had a choice. It came to me as a need more than anything else. I knew there was something strange, oddly interesting about it, and I loved it. I did not expect many people would appreciate it, but I admit I hoped there would be some. And indeed there were and there are! And who is this mysterious Irenthoth? He is one of the main and oldest characters from my upcoming book. I regret to tell you I cannot tell you more at this moment. Join our newsletter on the right and get notified when the book is released to be among the firsts who will read it. This entry was posted in Blog, News and tagged chapter vii, creation, irenthoth's dream, meaning, recording. Bookmark the permalink. Our Third Album’s Name and Theme Announced!